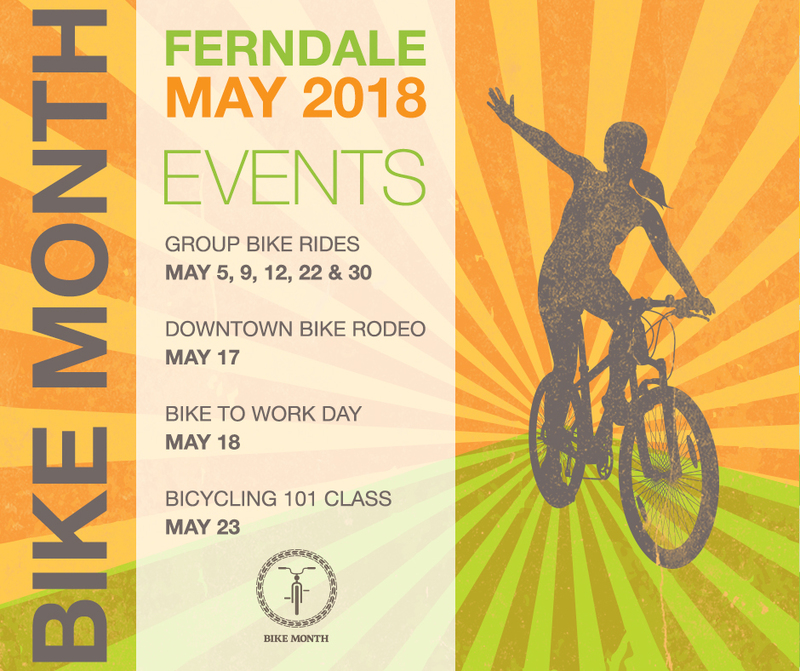 News: Ferndale Celebrates Bike Month! May is National Bike Month, and the City of Ferndale will join thousands of communities across the country in celebrating. Whether you bike to work or school; ride to save money or time; pedal to preserve your health or the environment; or simply enjoy exploring the city's restaurants, bars, and businesses, National Bike Month is an opportunity to celebrate the unique power of the bicycle and the many reasons we ride. Ferndale will get into the cycling spirit with a number of offerings—group rides, classes, and special events—scheduled throughout the month. So add these cool events to your calendar, grab a biking buddy, and get ready to ride! These three rides will start at 7:00pm and leave from Downtown Ferndale Bike Shop; join our Facebook event for up-to-the-minute information. Saturday, May 5. This group ride will incorporate stops at Ferndale and Royal Oak parks. Ferndale's Parks and Recreation Department will host this leisurely ride starting at 11:00am leaving from Schiffer Park (W. 9 Mile and Planavon) and showcase recent improvements, upcoming new park plans, and more. Pack a bag lunch for a group picnic in the park after the ride. Join our Facebook event for other up-to-the-minute information. Saturday, May 12. A leisurely ride between communities will incorporate mini-workouts with trainers from Ferndale's own The Fit Park. Bicycle around town, stopping for four workouts on your way to the Royal Oak Farmer's Market for healthy snacks (purchased separately). Start time is 10:30 a.m. leaving from The Fit Park (911 W. Nine Mile, Ferndale). Join our Facebook event for up-to-the-minute information. Thursday, May 17. Ferndale Parks and Recreation, the Ferndale DDA, and City of Ferndale team up for the third year to bring you the Downtown Bike Rodeo. The family friendly event will take place on Thursday, May 17, at Schiffer Park (9 Mile & Planavon) from 4 to 8 p.m. Featuring FREE bike inspections from the Downtown Ferndale Bike Shop, FREE bike skills test and bike licensing (must be a Ferndale resident for license) courtesy of the Ferndale Police Department and Police Auxiliary, FREE bike helmets (for kids) thanks to the Ferndale Rotary, and much more! Bikes must be on site for licensing and helmets. Join our Facebook event for RSVP registration and up-to-the-minute information. Friday, May 18. Join community members across the region for Detroit Bike To Work Day. Ferndale residents can meet other riders at W. Troy and Woodward to join the caravan on the trek to Downtown Detroit. Register for free! Wednesday, May 23. Are you interested in the rules of the road, hand signals, bike routes, and information on new bike lanes? Join us for a Bicycling 101 class at the Ferndale Area District Library on May 23 at 6:30 p.m. More information coming soon! If you have questions about Bike Month or any of its activities, contact the City's Community and Economic Development Department by email at ced@ferndalemi.gov.